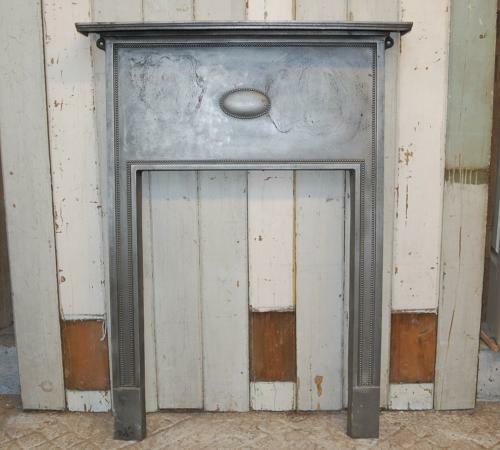 An elegant antique cast iron fire surround. The fire has a simple and classic oval design under the mantel, and beaded border around the fire opening. The surround has been stripped, burnished and lacquered and has an attractive silvery finish. The fire has the original fixing lugs present. The surround could be paired with a wood burner or a fire basket. The surround has an RD number, RD691327 dating the fire to between 1920-1929. The fire is antique and has some slight signs of wear. The fire has some slight surface tarnish and rust, mainly to the inner legs. The back has surface rust as expected. Some casting marks and slight pitting can be seen on the crossbar. The feet have some light scuffs. Please see pictures for details. The fire surround has beautiful detailing and a classic design. The burnished finish is interesting and attractive and the surround is a highly desirable item for both period and modern homes.